"fliegende Untertasse" is the German translation for "flying saucer." I thought that would be good to know as we're leaving on our German vacation in three days, and I want to know what to shout when I see a German flying saucer. I'm not sure how I will sound running around yelling "fliegende Untertasse," but I know the folks in Germany will appreciate that I took the effort. 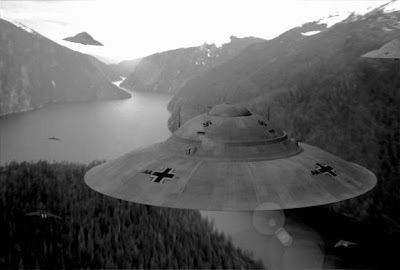 Apparently German UFOs all look as though they just came out of a World War II movie.